We are less than ONE week away! 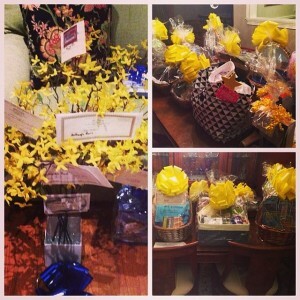 Just stopped by “Raffles Central” and the baskets look amazing! Tickets to see the NY Mets, tickets to the NY Yankees, a flat screen TV, an iPad, $100 in lotto scratch-offs, a spa-day at Mancini Giuffre, just to name a few. A special thank you to my unbelievable Zia Dina who has been managing the chaos and thank you to all of our family, friends and local businesses who have generously donated to our cause! We are very lucky to have such special individuals as part of our team. See you next Sunday! This was just a sneak preview of some of our raffles, to see all of our great prizes, sign up and come to Anthony’s Run on the 21st.